Find artworks, auction results, sale prices and pictures of Anton Filkuka at auctions worldwide. 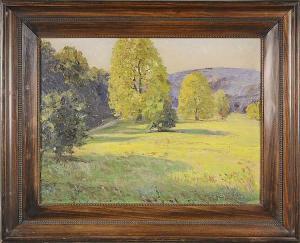 Lot 147: Anton Filkuka (1888-1957) Description: LANDSCAPE WITH A MEADOW AND TREES. Oil on canvas (mounted on board), 42,5x55 cm, signed lower right „A. Filkuka“. Framed. Condition B. KRAJINA S LOUKOU A STROMY. Olej na plátně (adjustováno na kartonu), 42,5x55 cm, sign. vpravo dole „A. Filkuka“. Rámováno. Stav B. LANDSCHAFT MIT WIESE UND BÄUMEN. Öl auf Leinwand (auf Karton), 42,5x55 cm, sign. rechts unten „A. Filkuka“. Gerahmt. Zustand B. This oil painting was made by the Austrian painter Anton Filkuka (1888-1957). It shows his daughter with a teddy bear and a doll. She is wearing school uniform as she sits on a wooden rocking horse, smiling dreamily at the observer. The painting and the wood frame are in good condition with signs of age and wear; the canvas has become wavy due to moisture. The painting measures 100 x73 cm. Anton Filkuka was born in 1888 in Vienna and studied ibid. at the academy with Sigmund l\’\’\’\’Allemand. He also studied at the colleges of Heinrich von Angeli and Kasimir Pochwalksi. He was awarded the gold Dürer medal and the special merit award of the city of Vienna. Fikulka died in 1957 in Vienna. 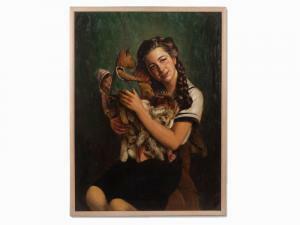 His oeuvre is representative of traditional Austrian painting. His paintings are to be found in public collections in Düsseldorf, Geneva, Stockholm and New York. 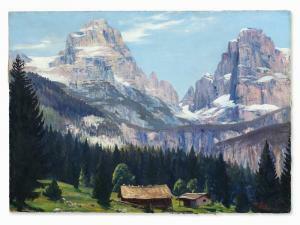 In this painting Anton Filkuka has represented an impressive mountain landscape in his typical manner. The foreground shows two huts in a clearing, surrounded by a thick pine forest. In the back the barren mountains, whose overwhelming size the artist has rendered in various nuances, rise before a blue sky. The occasional snow covers are painted with free, energetic brush strokes. The Viennese painter has created many poetic-realist landscape scenes in the Ausseerland, in which he captured the romantic atmosphere of the mountains and valleys in delicate tones. The painting is in very good overall condition. It is unframed. The work is signed lower right in red 'Filkuka'. On the left edge there is a small retouching. The stretcher frame measures 71 x 100 cm. Anton Filkuka studied at the Vienna academy under Sigmund l'Allemand as well as at the colleges of Heinrich von Angeli and Kasimir Pochwalksi. He exhibited his work in the Vienna Künstlerhaus as well as the Albrecht-Dürer-Bund and was awarded the gold Dürer medal and the special merit award of the city of Vienna. 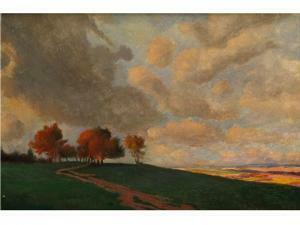 His oeuvre is representative of traditional Austrian painting. After the Second World War he lived and worked mostly in Altausee and created genre scenes of the peasant milieu in addition to his numerous landscapes. Filkuka's paintings are to be found in public collections in Düsseldorf, Geneva, Stockholm and New York. The painting is in very good overall condition. It is unframed. The work is signed lower right in red \‘Filkuka\’\’\’\’. On the left edge there is a small retouching. The stretcher frame measures 71 x 100 cm. Anton Filkuka studied at the Vienna academy under Sigmund l\’\’\’\’ Allemand as well as at the colleges of Heinrich von Angeli and Kasimir Pochwalksi. He exhibited his work in the Vienna Künstlerhaus as well as the Albrecht-Dürer-Bund and was awarded the gold Dürer medal and the special merit award of the city of Vienna. His oeuvre is representative of traditional Austrian painting. 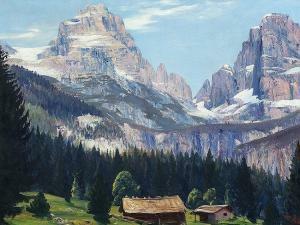 After the Second World War he lived and worked mostly in Altausee and created genre scenes of the peasant milieu in addition to his numerous landscapes. Filkuka\’\’\’\’s paintings are to be found in public collections in Düsseldorf, Geneva, Stockholm and New York.